London Bound – The Here and Back of It All! So – I pretty enthusiastically announced a couple weeks ago that my family and I are bound for London Town for Christmas 2015! This is pretty much a dream come true for me and has been on my bucket list for as long as I can remember…so to temper my enthusiasm* just a wee bit, I thought I’d “count down” the time until we are London bound with a few posts about the adventure ahead. The first and most crucial step in all of this – booking a flight to the UK! I don’t think the whole thing really seemed “real” until my Mom sent the email confirming we had tickets booked to head to London on Christmas Eve…on a British Airways Airbus-A380! Are you looking really closely at that picture? If so, you might notice something very important – that plane has more than one level! Yes, you read that correctly – we are flying to the land of the double decker bus on…a double decker plane! This plane has seats that can completely recline…so you can sleep! I’m pretty sure we aren’t in those seats though, ha-ha! The Airbus-A380 is classified as a superjumbo jet…because obviously just one synonym for huge wasn’t enough. The length is equivalent to that of two blue whales laid end to end…and it weighs 590 tons. It has enough space to carry approximately 3000 suitcases…and 500 passengers. It holds 81,900 gallons of fuel. Whoa. It requires more than 3600 liters (the metric system, ooh wee…) of paint to cover the plane. Only 20 runways in the world are capable of handling an A380 take-off/landing. It has the largest wings ever created – 54% larger than a Boeing 747! The plane has a staff of 21 flight attendants. During takeoff, the wings actually “flap”; the tips flex upwards as much as 13 feet. Each seat has an individual video monitor that allows you to watch the progress of the flight from cameras mounted below the cabin and on the airplane’s tail. So – there are only 147 days until we arrive in jolly London town and we will be arriving via what I think I’d like to from here on out refer to affectionately as “the behemoth of the skies”. Actually, I really want to call it “that really big a** plane”…but maybe some people would take offense? Either way, we are London bound to celebrate Christmas and ring in the New Year – and we are getting there on the monstrosity known as the British Airways Airbus-A380! *** Wooohooo! I’m fairly certain this is a joke – but hey, I wish! *I’m just kidding – there’s no tempering my enthusiasm. We are GOING TO LONDON! **Let me correct myself. 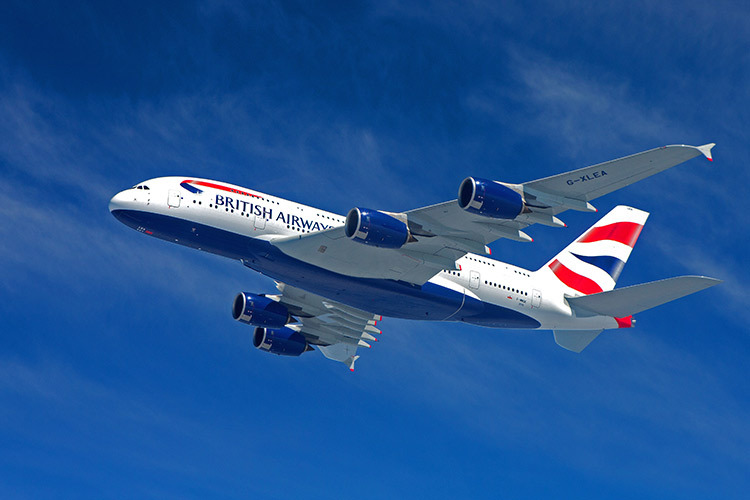 According to the British Airways webpage, the Airbus-A380 is the world’s largest passenger aircraft. Whoa. ***So far, I think this is my Dad’s favorite aspect of the trip. Not that we are going to London…but how we are getting there. He’s just plane nuts. Pun 100% intended. Has anyone ever flown on one of these bad boys before? I’m not a huge fan of flying but I have to say, I’m intrigued by it all. Someone got a very fancy new collar & thought everyone would want to see it. 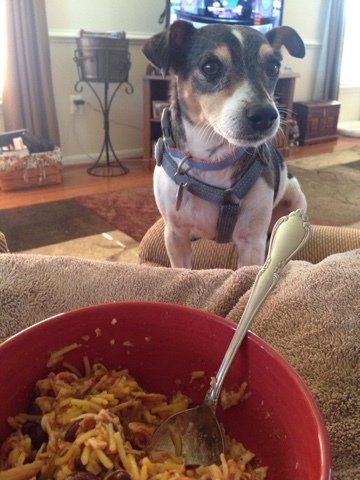 You know if Watson wants some, it’s probably delicious! I pinned this recipe on my “I Need to Cook This” pin board ages ago…and since it’s a Pintrest recipe, you know what that means, right? It could be really delicious or it could be a complete dud. I’m happy to report that I really liked this recipe and I’d definitely recommend it; which is I suppose exactly what I’m doing. 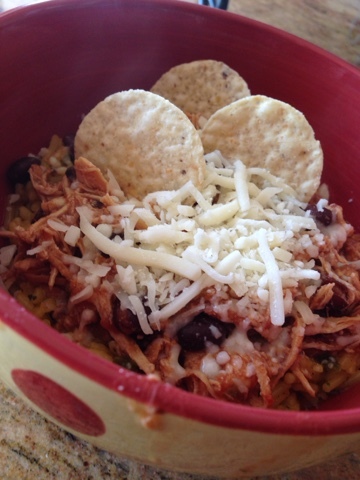 If you are a fan of Mexican-style food, this is definitely a way to add some variety to the same old taco/enchilada options. 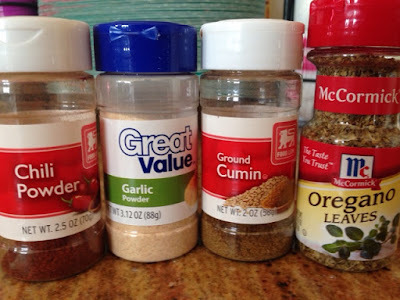 Kitchen confessional – no doubt about it. Someone needs to create a better way to package frozen meat or I am going to straight up lose my mind. This picture makes me hungry…. – Liberate your frozen chicken from the packaging…try not to damage the chicken or yourself in the process. Seriously, I was wielding a knife and that is precarious. 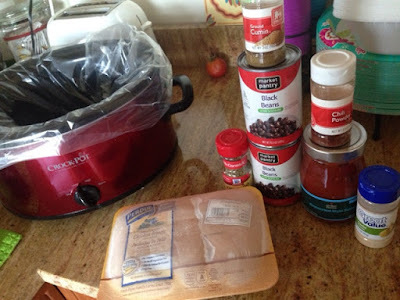 – Put chicken, black beans, corn, jar of salsa and seasonings in the crock pot. 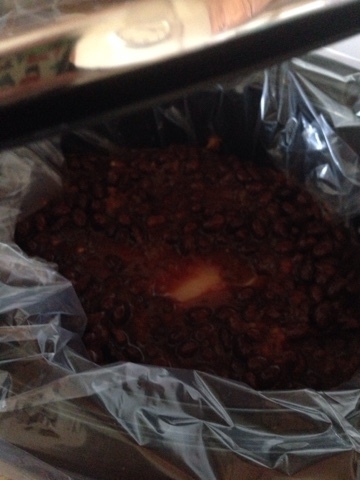 Cook on low for 8 hours. 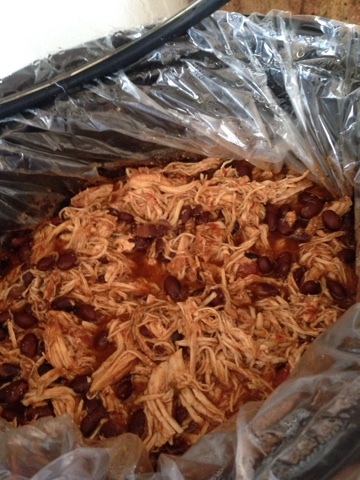 – Shred the chicken, mix well with bean/corn/salsa mixture and put the crock pot on warm. 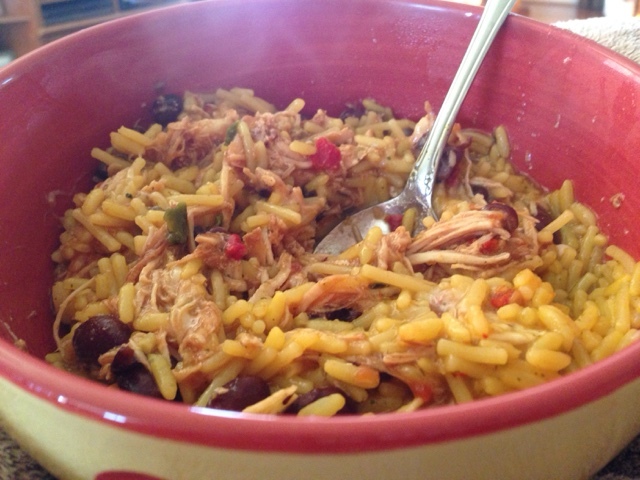 – Layer the chicken mixture over rice in a bowl…or on a plate. However you roll is fine. It’s your kitchen, ha-ha! Garnish with your choice of shredded cheese, tortilla chips..maybe you even want to throw some parsley or a slice of avocado. Sour cream? Guacamole? It’s your food – go for it! I definitely let a little leak over the side. Oops! Delicious. Easy. That’s all you need to know – right? So – maybe try this out. And I said it was easy…but I’m not promising that getting that frozen chicken free from the packaging will be easy. However, if you can conquer that step then you will be well on your way to a delicious and simple supper! 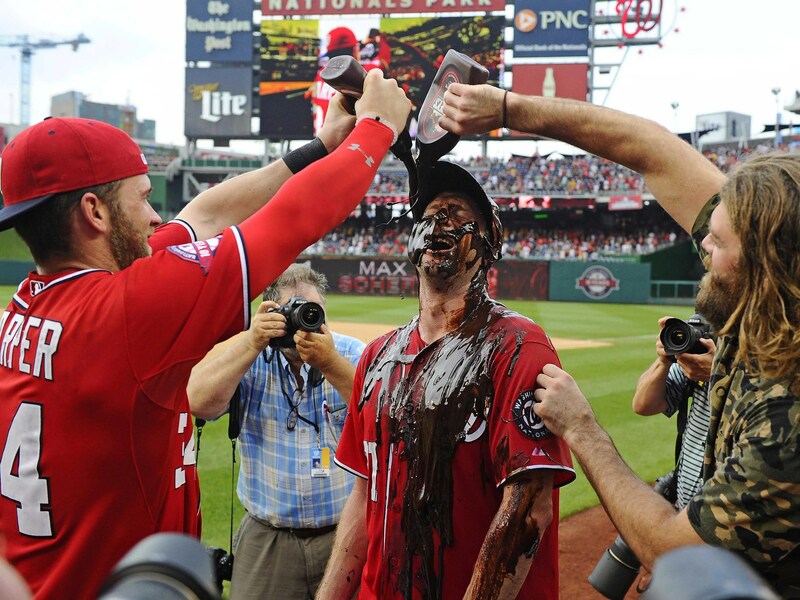 I mean – I’m looking at this and I feel like maybe a large majority of my week was made up of watching Nationals baseball…and I am 100% fine with that. Even if some of the games weren’t really the best; it’s been a rough week to be a Nationals fan. Alas, I soldier on and hope the games I spend my time watching this week will be less of a heartache. 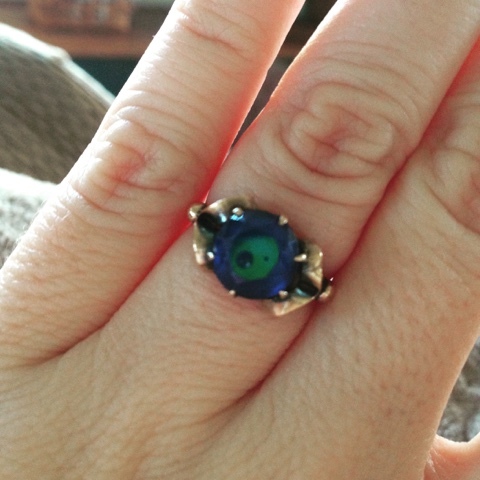 Other stuff happened this week too – I promise. 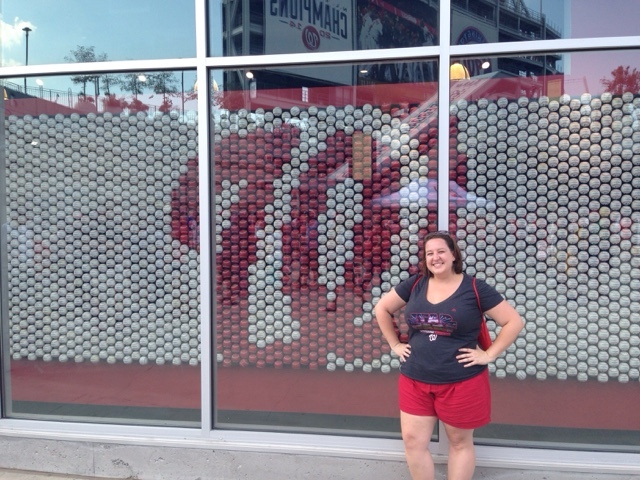 I DID actually do more than watch baseball games on MASN. Even if it doesn’t look like it, ha-ha! 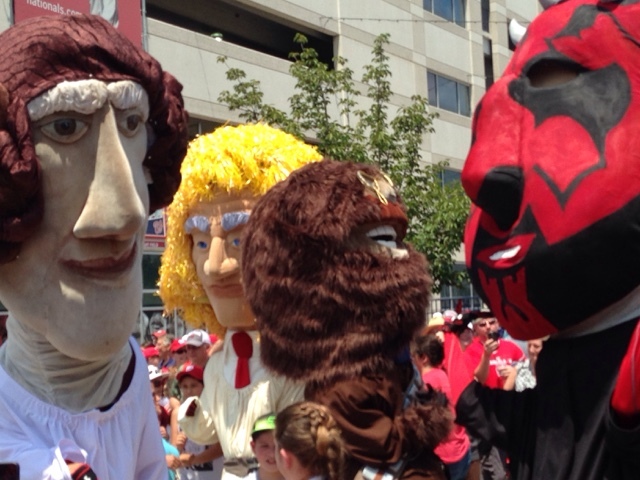 The gentleman in the red cap (not Harper) must have season tickets….he keeps popping up at every game! 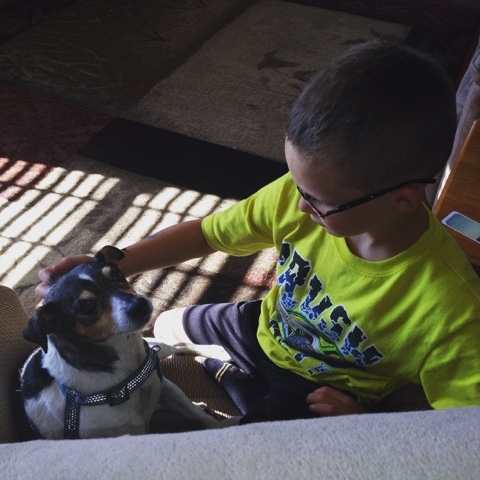 A boy & a dog. On Tuesday afternoon I brought my friend Jennie’s little boy home with me to hang out for the evening; she was working a little later than usual. Jimmy arrived at my office at 5 and since I had some things to finish up, I had him sit quietly and play light saber battle; he always allies himself with the Dark Side…I can’t convince him otherwise. We went out to eat with my Mom at Applebee’s and proceeded to have the quietest supper I’ve eaten in a long time – he insisted we play the Quiet Game once our food arrived. I learned pretty quickly that I must have gotten my talkative gene from my Mom…she just couldn’t keep her mouth shut, ha-ha! Jimmy and I finally called a tie as we were leaving the restaurant and he proclaimed that he “didn’t know that we would both be so good at being quiet, but Mrs. Ginger was really bad at being quiet!” I tried to watch some of the Nationals/Mets game but I needed to walk and Jimmy was getting that glazed expression after 2 innings, so I took mercy on him, changed the channel to Nickelodeon and headed out the door. Wednesday was the “rubber” match between the Nationals and the Mets…rubber match meaning the Nationals had won one of the games in the series, the Mets had one one of the games and this third game is the one to determine who wins the series. 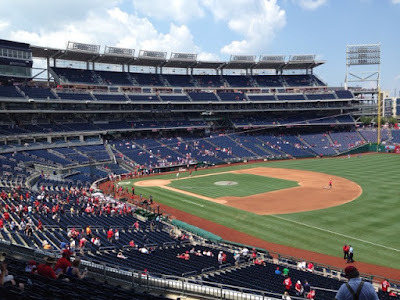 I have myself set up so the Nationals Twitter feed reports play by play information to my cell but I’ve also discovered that on the MLB website you can pull up something called At Bat and it will give you a virtual game. 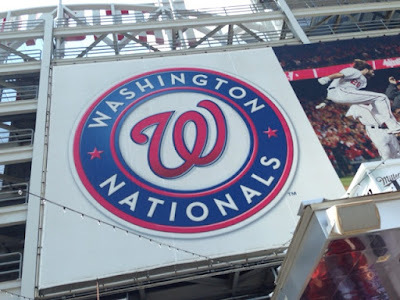 So, I definitely kept that running on Wednesday for the nail biter between the Nats and the Mets; the Nats came from behind at 3-1 in the eighth inning to win the game 4-3 – thank goodness! It provided a certain thrill in the midst of an otherwise average Wednesday work day. 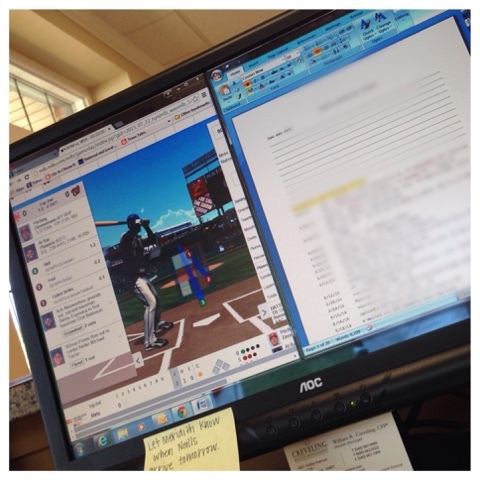 Just “watching” some baseball throughout the afternoon. 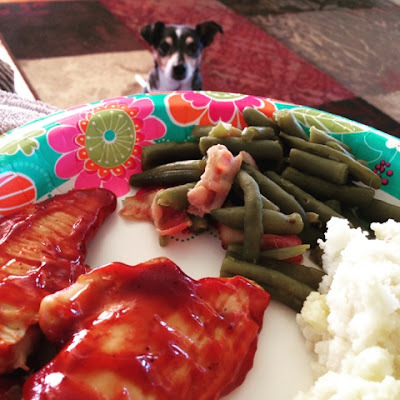 BBQ Chicken, mashed potatoes & green beans – Watson thinks he’d like some bites. I was home alone from Wednesday afternoon through the weekend – which I always enjoy. I don’t mean that to sound awful because I love my parents and I’m so thankful to be crashing at their house…and I feel like I’ve said this all before…same song, different verse kind of thing. 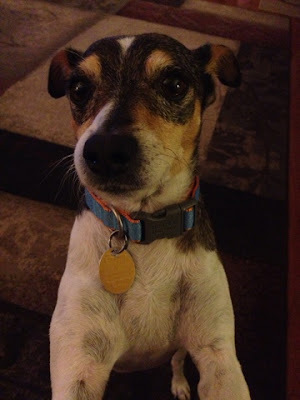 Anyway, Watson seems to be a lot more snuggly when they are gone – I don’t know if he thinks since there is only one human in the house, he should really squeeze them for love and affection. I really have no clue. 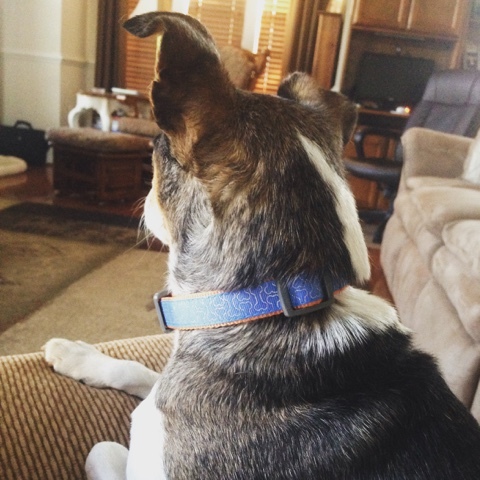 He sat in the chair with me on numerous occasions to watch baseball games and episodes of Parks and Recreation and I always love having puppy dog cuddles. See…my desk sort of looks like that Nationals line-up picture…. This is totally baseball related – see that bat? See that baseball?? Friday was a rough day – the work week has been hectic and Friday was the culmination of all of that…I’ll leave it at that and just say I was awfully happy to see 5 o’clock roll around. Granted, I was happy at lunch when I left the office for twenty minutes and FINALLY found a copy of ESPN’s The Body issue…although I still have yet to see an issue with Bryce Harper on the cover. *sigh* Oh well. 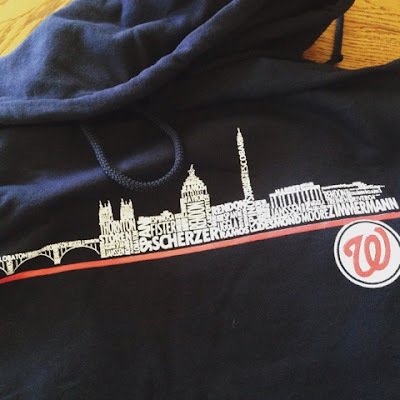 I did have a package waiting for me and it was my Nationals pullover that I’d been waiting on for weeks and weeks…and I loved it immediately and it fit perfectly and so that made me happy. It also made me happy that my crock pot meal turned out to be delicious and so as the night started, I was feeling pretty good. 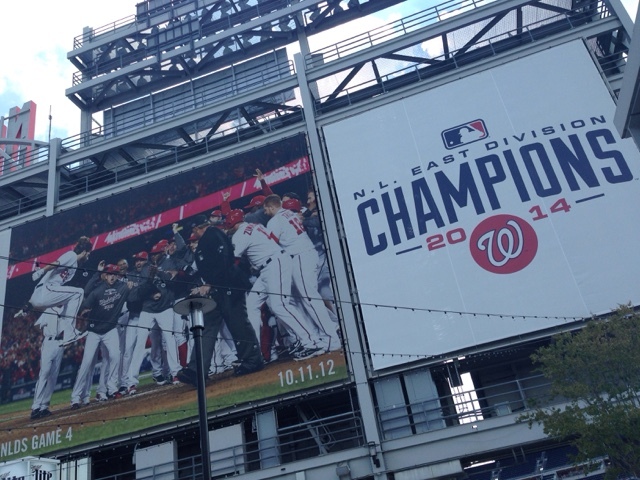 Sadly, then the Nationals lost their ball game and that was a bummer. It’s just a constant up and down, isn’t it? Also – one of life’s biggest mysteries – why is it that when you have somewhere to be on a Saturday (or I guess any other day really) you could sleep until the cows came home, but when you have absolutely nowhere to be…you wake up before 7 AM? Can someone explain that logic? No? I can’t either, but it’s a real problem. 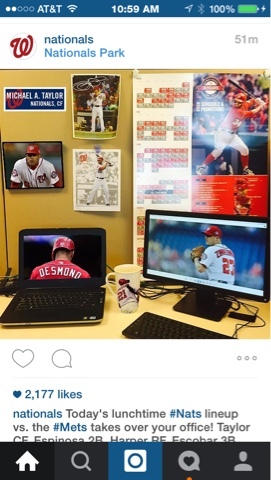 I still love it…but it only has one Zimm on it?!? 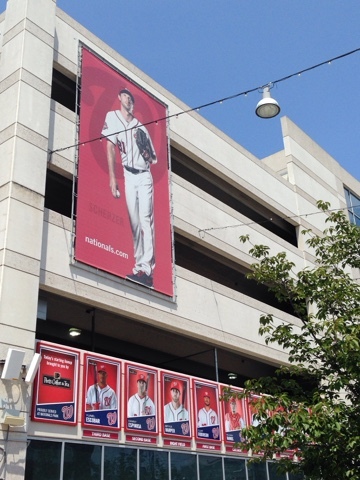 I see Zimmermann…but I don’t see Zimmerman. Come on!!! Saturday was a semi-adventurous day. Every July, the Shenandoah National Park has Blackberry Delight; a festival celebrating all things blackberry! I’ve never been before but I have had the blackberry ice cream and that alone was enough to entice me to take the trip up the mountain with my friend Katie and her husband Chris to see what the festival was all about. They had music and activities for children and of course, you’re on the mountaintop so the views are pretty incredible…but don’t doubt for a minute that the real draw here is the food! Blackberry BBQ Pulled Pork and Grilled Chicken with a Blackberry Jalapeno glaze, Blackberry Lemonade, numerous types of Blackberry wines and beers (which I did not sample…) and of course, Blackberry ice cream! 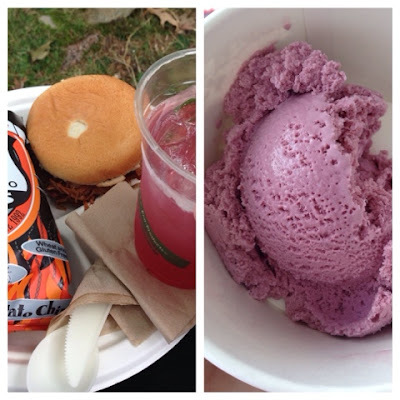 They also had Blackberry Cobbler and some kind of Blackberry Float, as well as Shortcake…but I went with Blackberry BBQ Pulled Pork with Blackberry Lemonade and a scoop of Blackberry Ice Cream for dessert! The amazing view from the top of the mountains! 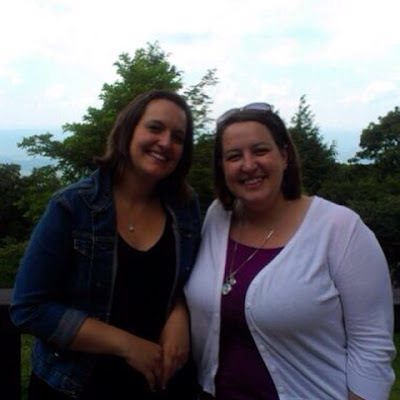 A sort of fuzzy picture of Katie & I at Skyland Lodge! Once we made our way back down the mountain, Katie’s husband suggested we stop in at a local eatery called PaveMint for an afternoon “snack”…although I really think (okay, I know) he was interested in the beers on tap at PaveMint. This little place is like nothing I’ve ever been to before; it looks like a gas station from the outside but inside everything is red, teal and wood…and the food is absolutely delicious! Yes – that’s right, we’d just had BBQ and chicken and desserts aplenty on top of the mountain and we were going for round two in the valley – deal with it! 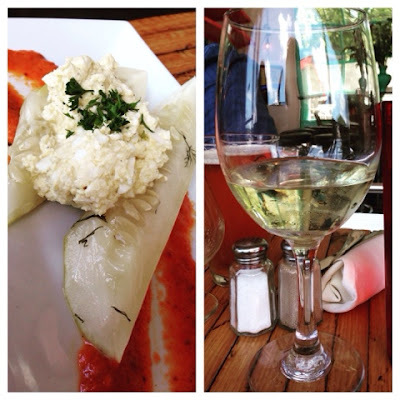 All of the food is farm to table and is house made…and everything I tasted was delicious! We had Polenta Fries (do you know what polenta is?? My computer doesn’t; it wants to spellcheck polenta to tadpole…go figure) and Dill Devils; both were delicious but the Dill Devils were my favorite! The Dill Devils were house made dill pickles topped with an egg salad (that I scooted off of my pickle) and sat on a Chili Pepper sauce. They were delicious! The glass of Riesling that I drank was also delicious, ha-ha! If you live in or around the Front Royal area, I’d suggest you check this place out – PaveMint! Pickles & White Wine – I obviously have a very refined palate. 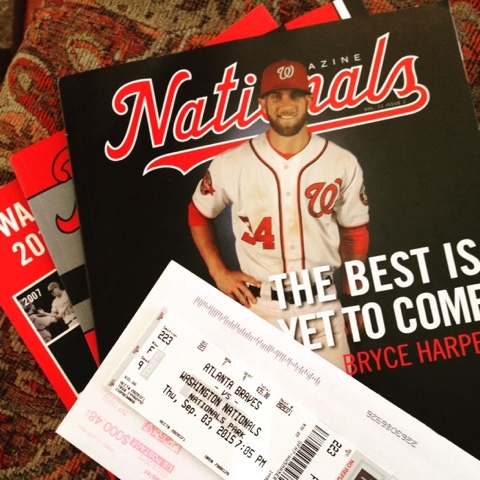 Some of the best mail you can get – tickets to a Nationals game, Nationals Magazine & the 2015 Yearbook. 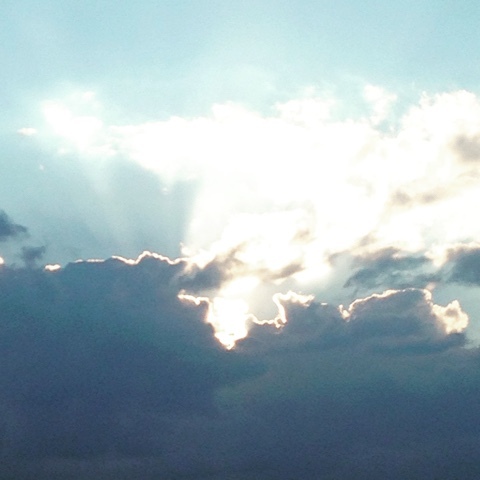 The weekend ended so quickly – I had big plans for myself on Sunday but they didn’t quite materialize. I had to drive into DC to pick up Jeff and Ginger from Raegan but I planned to drive in earlier in the afternoon and spend some time wandering around…I had thoughts about going to the FDR Memorial; it’s in the shade and there are lots of fountains…but when I was on my morning walk/sporadic jog, I started to get a headache. I assumed it was due to lack of eating combined with the heat and so I didn’t take anything, assuming it would go away when I had breakfast. It did not and by the time I took something at 1:30, it was too far gone to be helped. 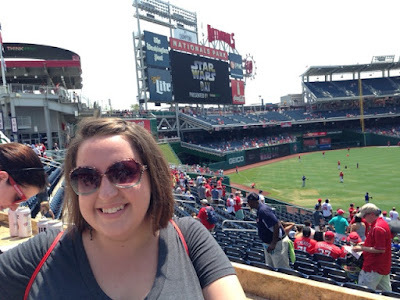 I ended up falling asleep in the 2nd Inning of the final Nationals/Pirates game (we were ahead!) 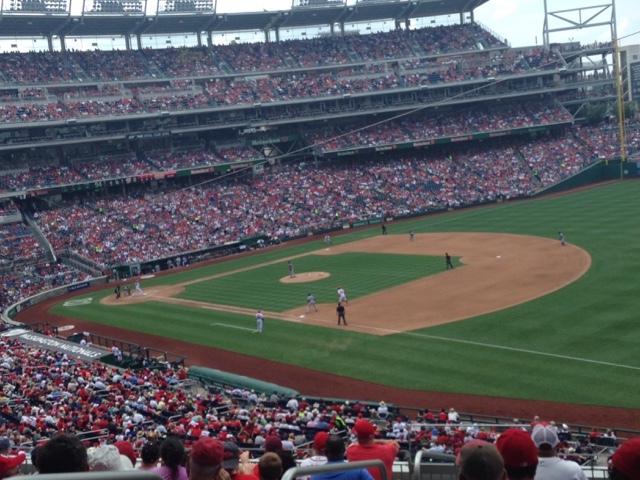 and woke up at the bottom of the 7th to see that we’d lost the lead…and watched as we never regained it. My head did quit hurting around 4:30 and so I changed and headed into DC – I had plans to grab something from the Starbucks in Reagan…but that’s a story for another time. When all was said and done, I walked from one end of Reagan International to the other…and then some…but I got what I came for…and who I came for…and I added almost another 2 miles to my daily walking, ha-ha! The weekend closed pretty calmly, having dinner on the patio of Logan’s with my parents while the cool Summer breezes swirled around. Doesn’t that sound nice? 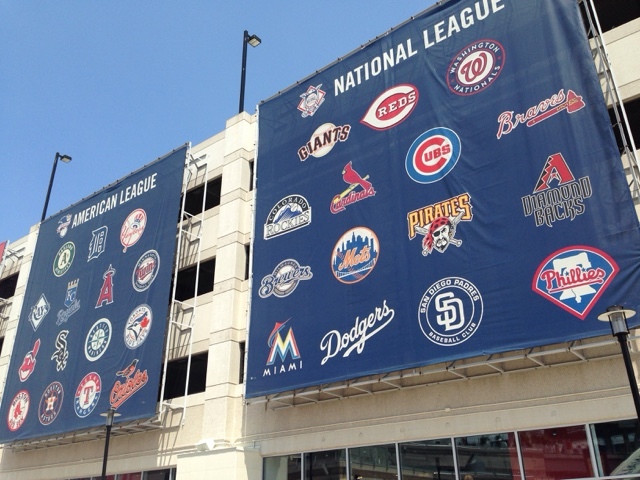 It was nice…so I’ll leave you with that pleasant image and try not to talk about baseball so much next week. I can’t make any promises though. The clouds roll over the mountains. Are you kidding me? July is already over and done with?? 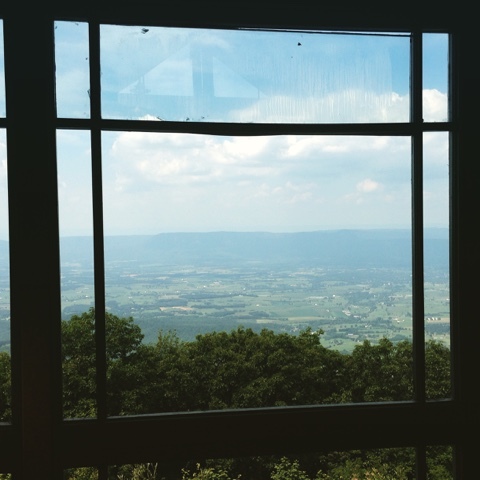 This will be my first full year in Virginia and it is passing so fast it makes my head spin – but even as I type that, I know it’s passing so quickly because my life here is so full! All I have to do is look at my calendar to know that. Just this past month I’ve been to movies with friends, spent time in Baltimore and DC, been to two Nationals games, explored the Shenandoah National Park from above and below the mountains and just enjoyed the simplicity of having coffee with friends. This pace isn’t likely to slow down anytime soon – there is too much to do, too much to see and way too much life I want to live. 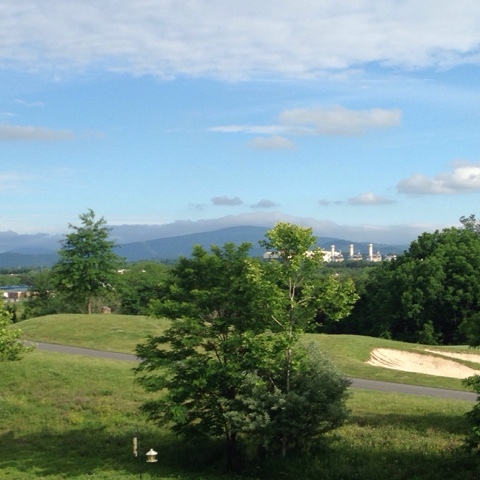 But, lest I get ahead of myself…here’s what I was up to and into in July! Written in My Own Heart’s Blood by Diana Gabaldon – The eighth book in the Outlander series; I swear I have been reading this series for a almost a year! I guess that’s what happens when you stop to read other things in between, huh? The (final?) book follows Claire and Jamie as they seek to escape the Revolutionary War and return to their peaceful home on Fraser’s Ridge…but it may not be as easy as they’d hoped. Jamie is grappling with his long lost son William finally knowing the truth about his parentage, Claire and Jenny are rebuilding their rocky relationship and years away, Brianna is making a drastic step through time to reunite herself and her children with Roger. Yes Please by Amy Poehler – I do love some funny girls who write books; examples including Tina Fey and Mindy Kaling…whose books I have already read, so naturally Amy was next on the list. I enjoyed this book but I think what I really loved more than anything was Amy’s outlook on life. It seems in all situations, Amy manages to find the good or at the very least find something to laugh about. I guess that is one of the perks of having such an incredible sense of humor! Property by Valerie Martin – August Book Club Pick! Also a really interesting read! I will preface my “review” by saying I still have a bit to go to be finished…but so far… The book really skews the idea of who was property in the Southern states during the 1800’s. The book centers on the relationship between Manon, the wife of a sugar cane farmer and Manon’s house slave, Sarah…who also happens to be the mistress of that same sugar cane farmer. While the obvious “property” in the book are the unfortunate slaves, a strong case is also made for Manon – as a woman in the 1800’s, she has few rights of her own and is at the beck and call of her husband. I can’t even believe I’m writing this…but I have no books in the queue! I have tons of books that are waiting to be read, but I don’t have a particular one that I’m just waiting anxiously to start reading, so it’s anyone’s guess what I’ll crack open next! Poldark – This show moves so quickly! When I last posted, only two episodes had aired but I had my feelings about how certain things might play out…and some of those feelings have been confirmed! Ross did fall for Demelza; late in the third episode (yes – it moves that fast) he married her, thereby lifting her from her poverty stricken state as a servant and turning her into a Lady. Although actually grooming her ladylike behavior took a little bit more time and some help from cousin Verity. 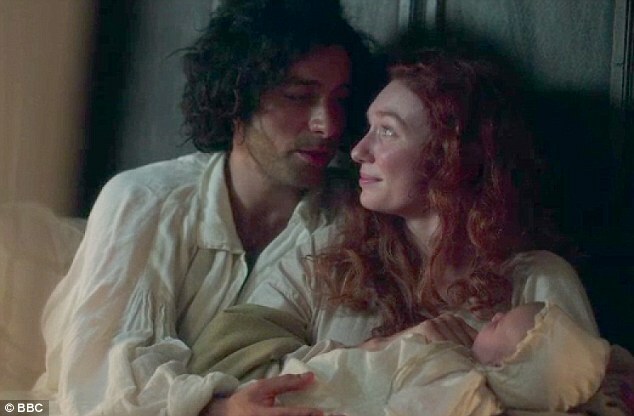 Ross’ mine is flourishing, his relationship with Demelza continues to blossom and their sweet baby Julia is just delightful…but one has to wonder with his cousin Francis facing hardships at every turn, how long will Ross be able to stay afloat? Only two episodes left until this first season wraps up! 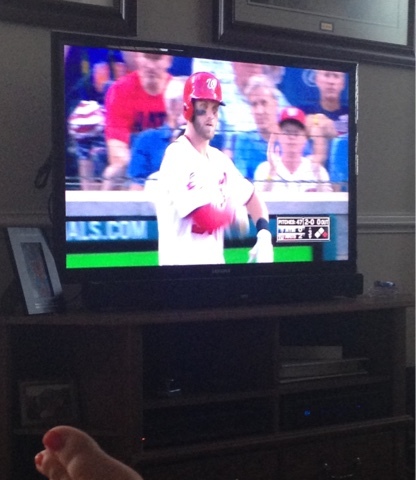 Nationals Baseball – Oh yes, MASN (Maximum Access Sports Network) has become a very important channel in my house! I celebrated July 4th by having a “picnic” in the living room floor and watching the Nationals beat the Giants; Harper homer’d with a star spangled bat! 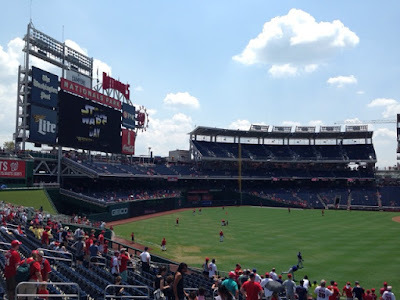 The Friday before we went to Baltimore, I watched the Nationals lose in literally the last at bat…one strike away from a win and a homer stole the show. I knew we needed to win on Saturday night to have a chance at a Series win. They won on Saturday…and again on Sunday! 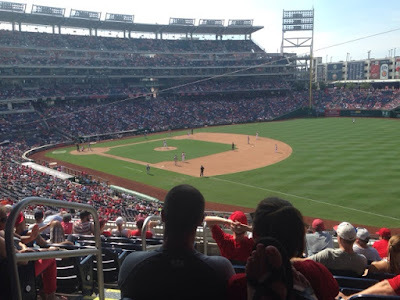 I spent Monday the 20th watching us smoke the Mets 7-2 with some excellent batting and absolutely incredible catches…and then watched on the 21st as the Mets turned it around and beat the Nationals 7-2…but the Nationals took the series! 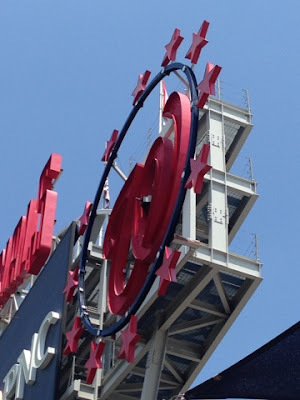 Only one more game to end July…the start of another series with the Mets…and with 12 losses and 11 wins in this month, it would be nice to end July with a Curly W! Magic Mike XXL – Ha! This movie is about exactly what you think it’s about! The trailer pretty much lays the plot out perfectly and it doesn’t deviate from it too much. A group of guys (who also happen to be strippers) make one last road trip to a stripper convention in Myrtle Beach and of course, all kinds of craziness ensues on the way! I don’t suppose there is really much more to the plot than that, ha-ha…but it was so much fun to see it with some girlfriends and just have a good time! 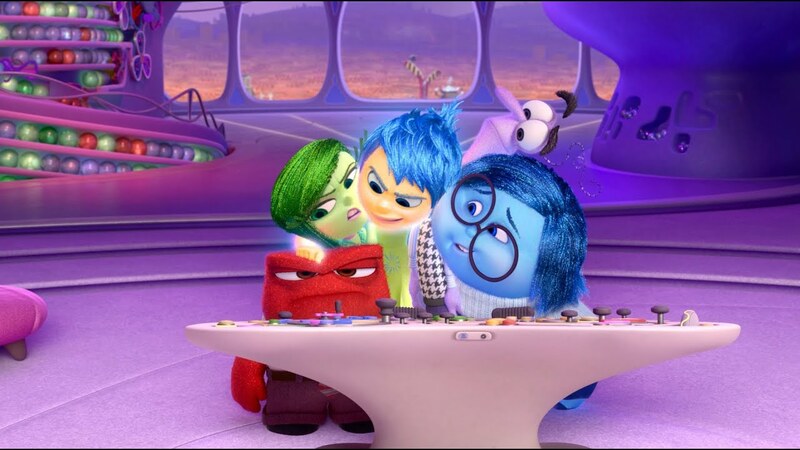 Inside Out – This was one of the best movies I’ve seen in a long time…and it made me have all the feels! The story follows the emotions inside Riley’s head: Joy, Sadness, Fear, Disgust and Anger; each emotion generating and tinging the memories that Riley makes on a day to day basis, those memories influencing who she is as a person. When Sadness “damages” a core memory and they are lost, Joy and Sadness must go on a journey to retrieve the core memories and set Riley to rights…while Fear, Disgust and Anger run the show. Just when you think Disney can’t come up with something else absolutely amazing, they do! If you haven’t taken the time to go see this, get on it! The little voices inside your head…. All pretty good songs to pound the pavement to! Besides that, it’s been a lot of sports radio (who am I, right?) although they are starting to talk a LOT of Redskins football since training camp has started and the good Lord knows I could care less about the Washington Redskins. Gross. 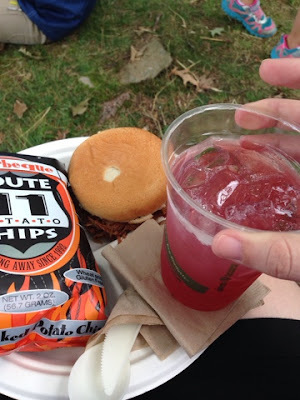 The Blackberry Delight Festival – Oh, you know…basically everything I ate that day was pretty amazing. So, if I could just have someone get that recipe for Blackberry Pulled Pork BBQ, Blackberry Lemonade and especially the Blackberry Ice Cream…yeah, that would be excellent. I’ll take this meal on repeat. Blue Wing Frog – A little hole in the wall cafe in Front Royal that has some seriously delicious food! It also has a giant picnic table in the middle of the cafe…so, that gives it cool points immediately. I’d go back here anytime! PaveMint – Another hole in the wall joint in Front Royal; I’ve really learned so much about my town and food this month! Everything is farm to table and while so far I’ve only had the Dill Devils and the Polenta fries, I saw other people’s plates and my mouth is already watering just thinking about returning! Tea at Rosemont – I have become a tea drinker in the last year and while my favorite place to frequent for tea (Ya’ll, I am so fancy….NOT) is the Horse and Coaches Tea Room, I’m looking forward to having tea at Rosemont. I toured Rosemont at Christmas and it was such a gorgeous house; I even tried to shut myself in the wine fridge, ha-ha! I’m sure tea at Rosemont will be absolutely delightful! Now – hold your pinky out as you say that! This is Rosemont – can’t wait for tea! 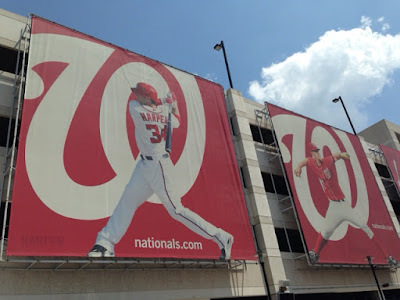 Nationals Baseball – Did you have any doubt this would be on the list? 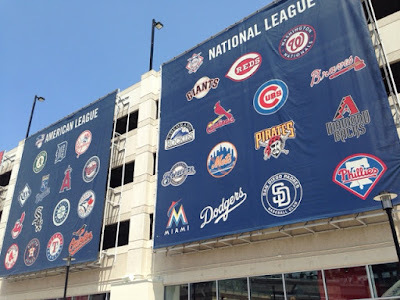 Just a heads up – baseball season goes into at least early October…and I’m hoping we will stretch it into the postseason this year. 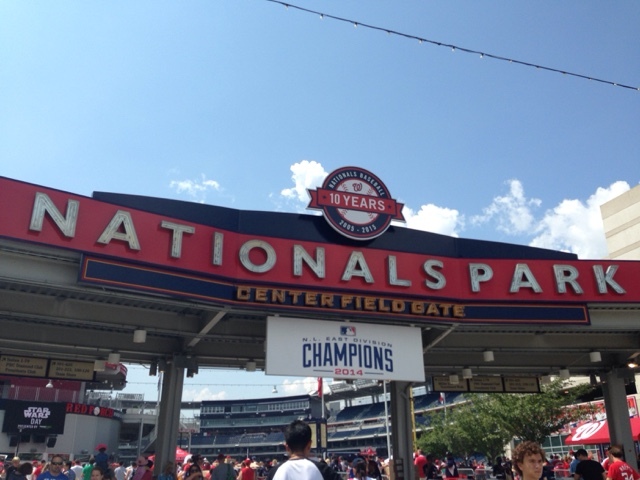 Go Nationals! 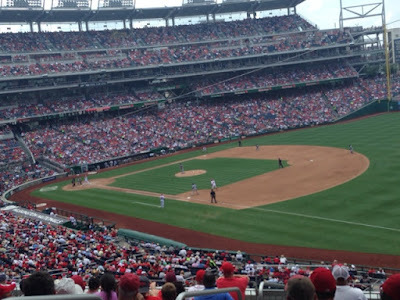 We are headed to a Friday night game in early August; the Nationals will be up against the Colorado Rockies and when the game ends, there will be fireworks! A Nationals game, at Nationals Park…with fireworks? What’s not to love? 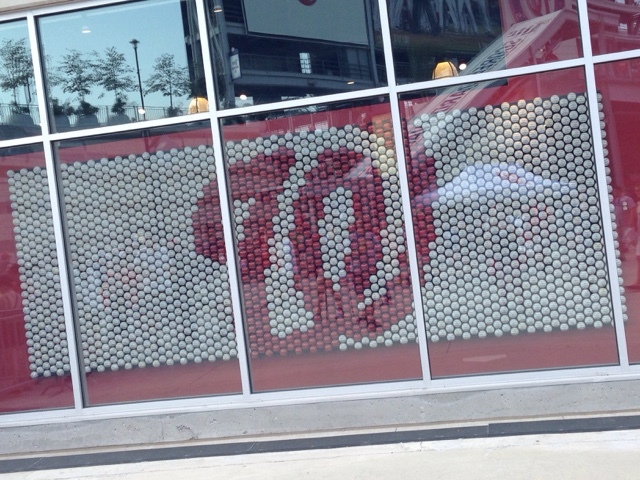 I mean – I’d love a Nationals game with or without fireworks, but I’m sure you’ve guessed that already! Twilight Polo – I will confess that I know next to nothing about polo…except that it’s played on horseback, they try to score “goals” and I’d fall off that horse and kill myself if I even tried. I have been perusing pictures and I feel like I need to find myself a frilly hat and gingham dress to wear to this thing… And, I think a polo match is what Richard Gere and Julia Roberts attended in Pretty Woman and if so, this will no doubt be epic! So – there you have it! Another month come and gone and already so much to look forward to in August! 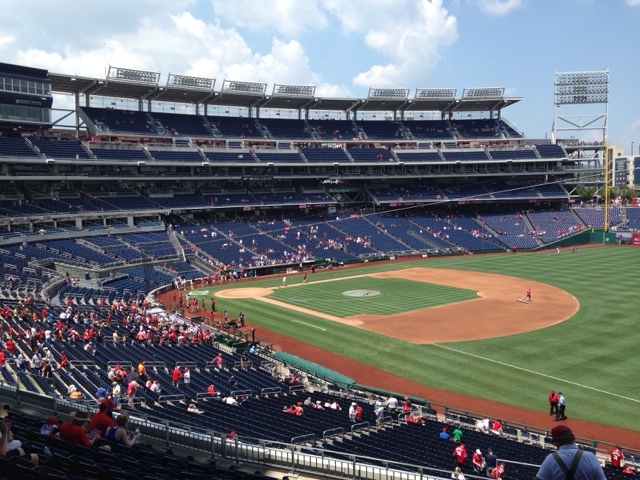 Spending Sunday afternoon watching a Nationals game, at Nationals Park? It sounds pretty perfect to me. 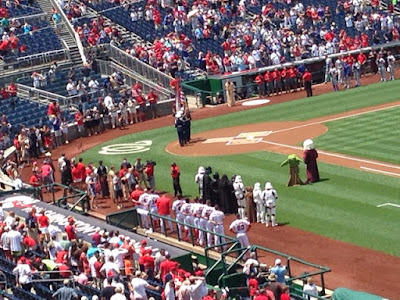 Spending Sunday afternoon watching a Nationals game at Nationals Park on the first annual Star Wars Day – well that is definitely perfection! Well…it would have been perfection if the Nationals had won, but it was still a pretty wonderful day! 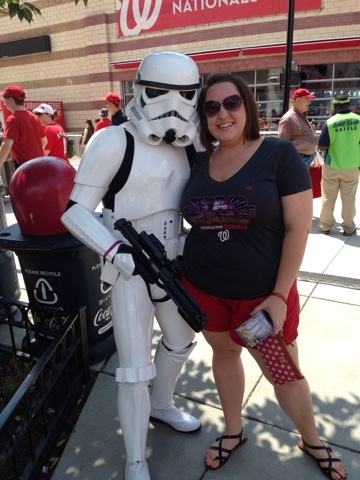 Storm Troopers – who knew they were so nice? 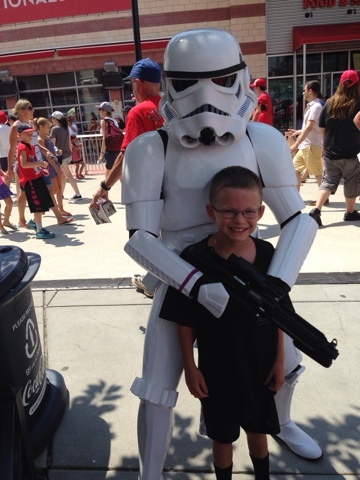 I think he was a little unsure…even if he does talk big about LOVING the dark side! 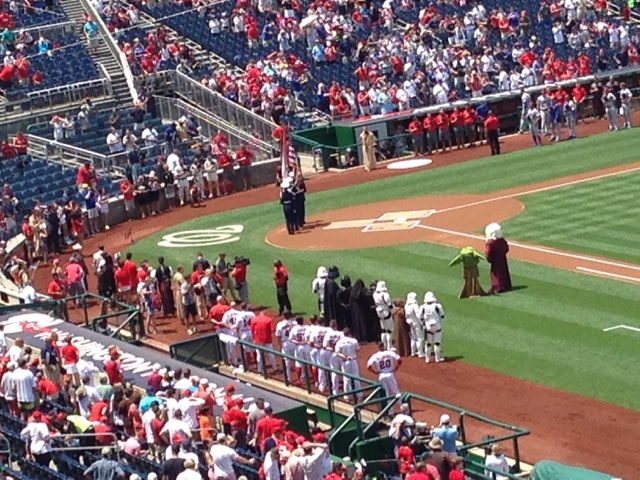 Two+ months ago, we went to a Nationals game and throughout the game they advertised Star Wars Day at Nationals Park. 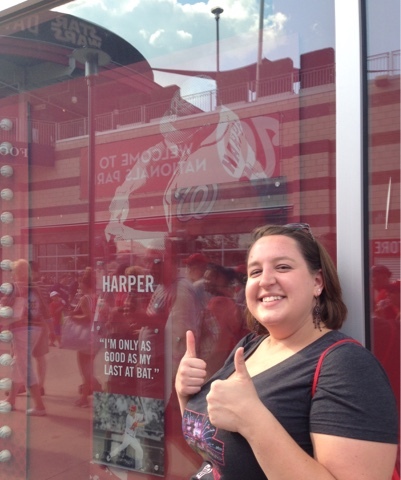 I mentioned offhand that I’d love to attend THAT game and then I got distracted by watching the Nationals beat the Braves as Harper hit a walk-off homerun – good times! 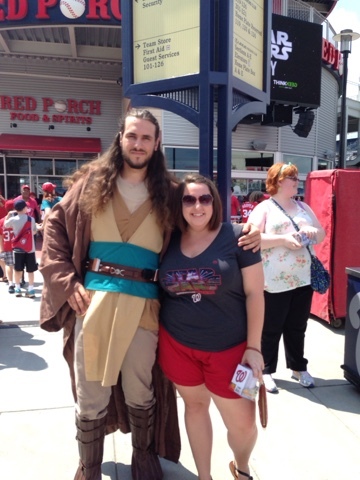 All the way home, I talked on and on about the baseball game and mentioned probably a million times that “wouldn’t it be the best thing ever to go to Star Wars Day? 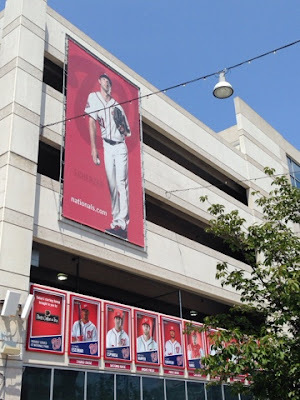 It would guys – it totally would!” I even found a press release about it and read it off, word for word so my parents would know what was up – I (kind of) wanted to go to this game! We mentioned it to my Star Wars loving friend Jennie and she said she and her son, Jimmy would love to join us…and thus, the plans were made and the tickets were purchased! 2014 National Leagues Eastern Division Champs! Harper & Strasburg – Super Sized! Warming up…both literally & figuratively. I’m sure you’re wondering what the deal is with all the pictures – or maybe you aren’t. This was my third time at Nationals Park but it was the first time I’d arrived well in advance of the game and taken the time to really explore! 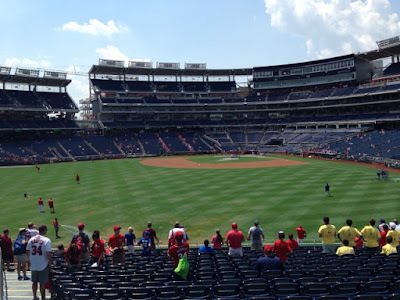 I wandered from one side of the park to the other…happily stood in the blazing sun and 97 degree heat (103 heat index y’all…DC isn’t playing around w/the heat) to watch as the Nationals and the Dodgers warmed up (literally) on the field. I traversed the Team Store, searching for a Scherzer shirt (sold out – of course, he’s amazing) and picked up a treat for my sister and then we made the loop all the way around the park toward our seats. I wanted to see it all! Nationals Park – one of my favorite places in DC – at least from April to October! One of the perks to being one of the first 25,000 people into the stadium – you got an R2-D2 can cooler! The game was a sell-out, so there were over 40,000 people at the game; I feel so sad for the 15,000 who didn’t get an R2…I love mine! Once we’d discovered our seats, I immediately set out to explore again – Jennie and Jimmy came with me to search for Darth Vader and I was looking for the Dream Foundation raffle guy so I could put my name in the hat for the split of the $9000 prize (spoiler – I did NOT win). 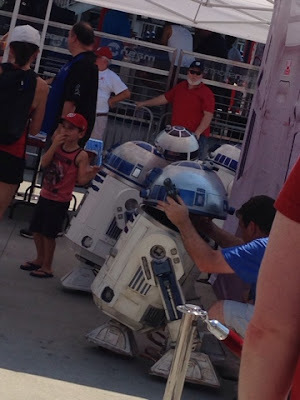 Once we found the line to “meet” R2-D2, I split off and wandered on my own, taking everything in and taking more pictures…including the Racing Presidents, who burst onto the scene dressed as characters from Star Wars! 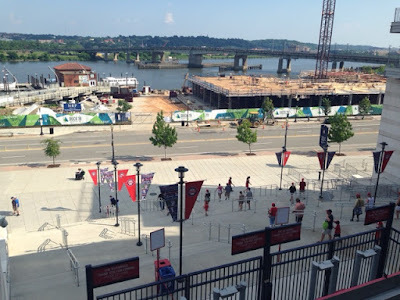 The view from Section 227 – thankfully located in the shade! This used to be a clock…but it never really worked, so now it just looks cool! 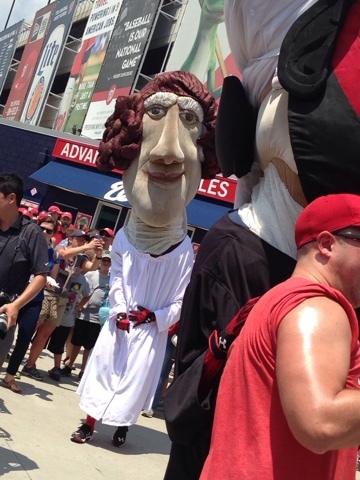 George Washington = Princess Leia. Yikes! 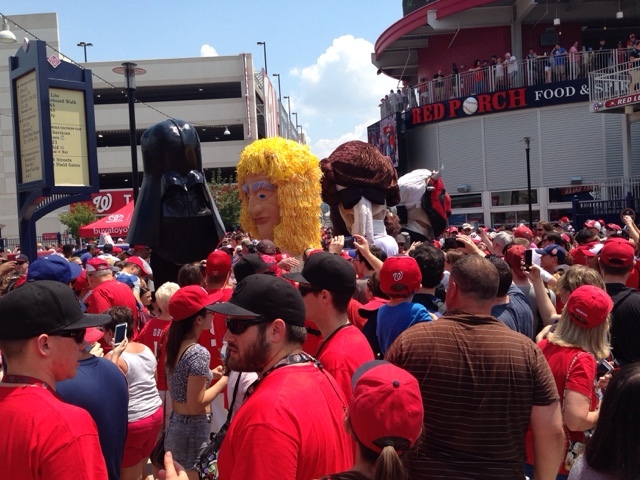 Screech & Lil Screech…or is that Yoda & a Jedi? 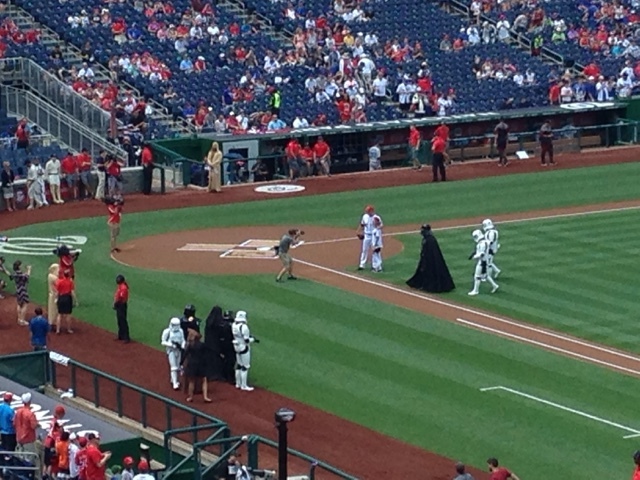 Vader approves of the first pitch. 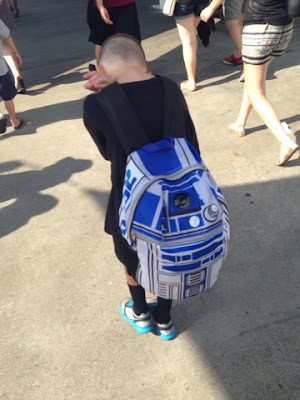 The game was filled with Star Wars related nods – there was food at the concession stands; I didn’t personally get anything but I read there was Hoth Shave Ice…and that would have been amazing since it was topping out at 97 degrees on Sunday! The grounds crew for the Nationals all had on costumes, appropriately dressed as either Jedi or Imperial soldiers as they made their turns around the field to get it ready for the game. The line-up was one of my favorite parts: every member of the LA Dodgers were represented as a Storm Trooper and their pitcher, Zack Grienke (sp?) was Darth Vader. The Nationals players were all members of the Rebel Alliance – several were Jedi, Espinosa was Han Solo (that mustache he has really stands out!) and Michael A. Taylor was Lando Calressian. And if you aren’t a Star Wars fan, then this all sounds like gibberish… Oh well! 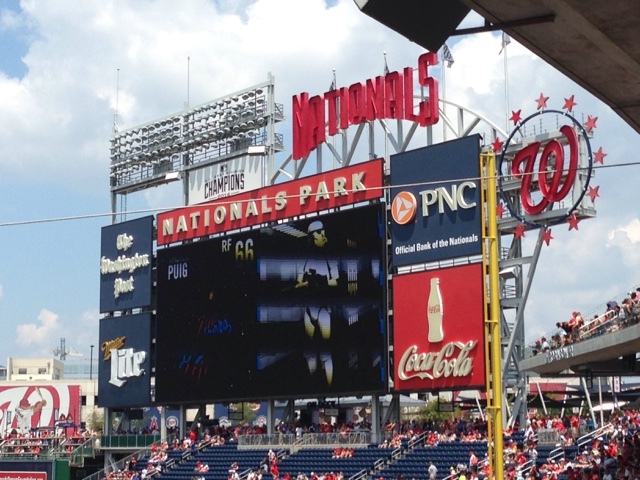 The best part had to be the message on the Jumbotron prior to the first pitch…. In case you can’t read what the screen says….look below! Rebels forces rallied late to secure victory in the first battle. The Empire struck back in the second conflict behind the Sith Lord, Kershaw. 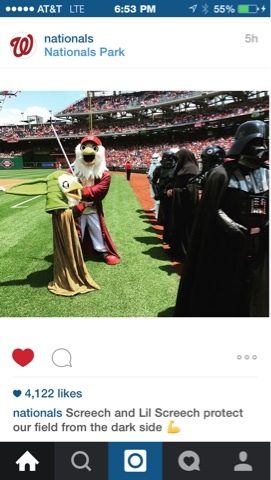 Today, Jedi Knight Scherzer returns to the fight in the decisive battles of this galactic series in the ongoing quest for league supremacy. 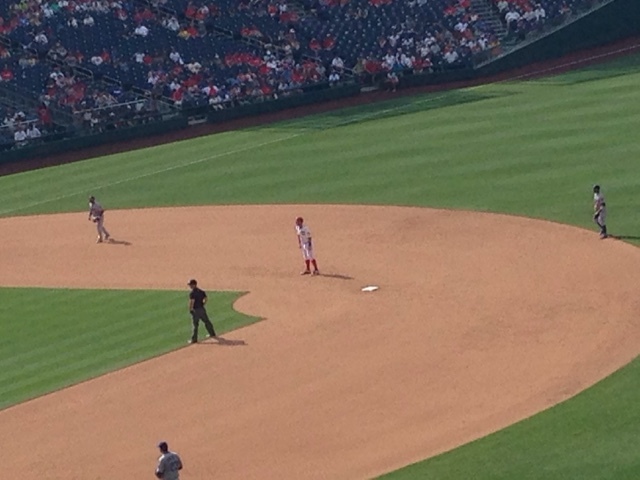 Harper hanging out on 1st. Jimmy sat to my left for most of the game and had plenty of questions – all of which I happily answered. He’s only seven, so he never quite got the point of “balls”. I think in his mind, every time the pitcher throws he is technically throwing a ball…so why wouldn’t you try to hit the ball every time? He also adapted the same rule for balls as for strikes – 3 balls = 3 strikes. I got pretty tickled trying to keep him straight. 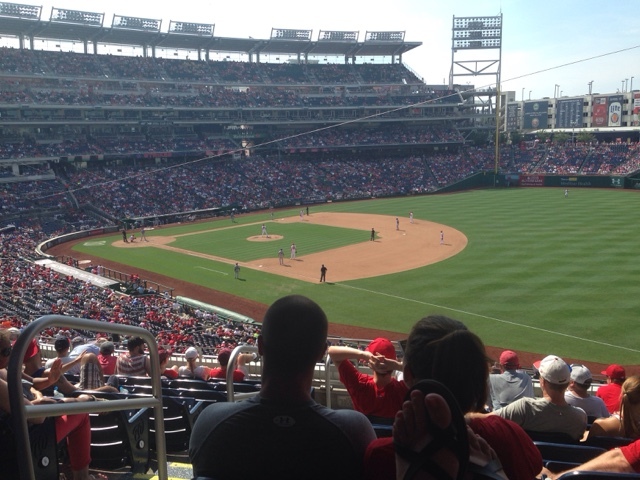 The game itself was pretty brutal; Nationals fan though I am, Grienke is a beast on the mound and the Nationals just couldn’t do very much against him. Scherzer had a good outing and the game held consistent at 1-0 for the first 8 innings, but when the Nationals put Treinen in at the top of the 9th, everything rapidly went downhill – he let the Dodgers score 4 runs before he could shut them down and while my Nats have made up more than a deficit of five runs before, it just wasn’t meant to be on Sunday. They fell to the Dodgers 5-0…not even a run on the board! Even chanting “use the force” didn’t seem to help! The view of the Anacostia from the second floor of the stadium. 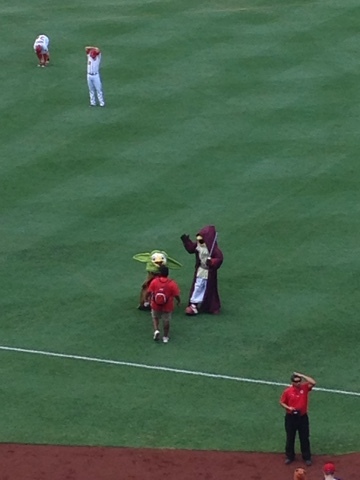 R2-D2 getting a helping hand out of the stadium after the game. I love all the signs! It was a pretty crushing defeat but baseball; as with so many things in life, is all about picking yourself up and looking to the next challenge. 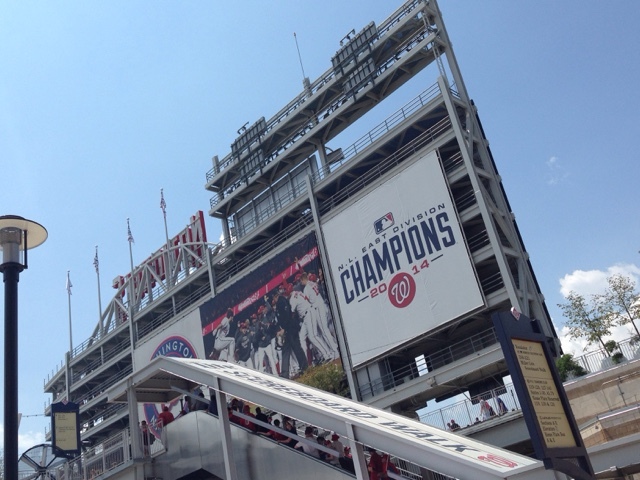 For the Nationals, that was a three game series with the Mets on July 20-22…which they won! Late in the 9th inning, Jimmy realized the team we’d come to cheer on was losing and he immediately declared he would henceforth be cheering for the “blue team”, which I kindly explained were the Dodgers. I also tried to explain to him that you don’t just choose to cheer for the team that is winning – you have to stick by your team, standing by them through the good and the bad. He’s seven. He wasn’t buying that logic for a minute and succinctly informed me that he was NOT cheering for losers. I guess without that Curly W, my talk wasn’t nearly as persuasive. A curly W – made from baseballs! 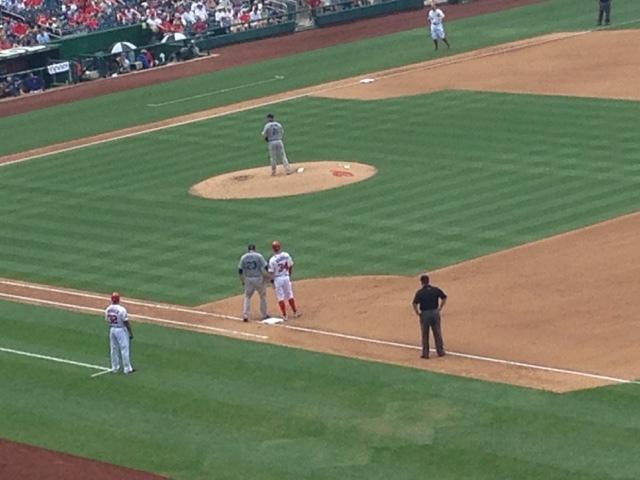 Love my Nationals & I especially love when they get a Curly W.
If he’s only as good as his bat…then he’s pretty good. Hehehe! 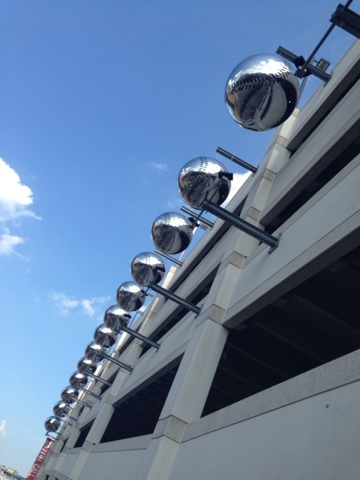 Baseballs adorning the outside of the park. All in all, I thoroughly enjoyed my day at Nationals Park – I love my team, win or lose. I love Nationals baseball; the crack of the bat, the sound the ball makes when it smacks into a glove, the Presidents Race in the bottom of the fourth, everyone waving their caps for military members as a thank you, singing “Take Me Out to the Ballgame” in the seventh…the walk-up music, the sound effects and generally just the whole atmosphere of the ball park! Oh – and how did I ever forget, the way the announcer calls out the names – names like Denard Span, Jayson Werth, Danny Espinosa and Bryce Harper just roll off his tongue with so much spirit. I love it! 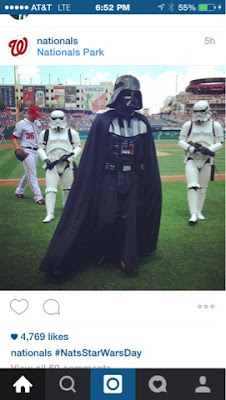 I stuck two pictures from the Nationals Instagram feed below – since their photographer was so much closer to the action than I’ll ever hope to get! Man – to be so close! Maybe one day I’ll get closer to the field! So – I suppose this was sort of another Micro-adventure. 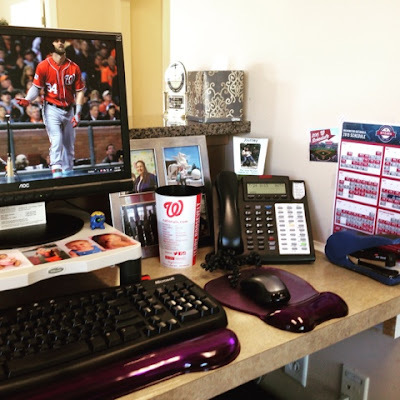 One things for sure, I love spending my time at Nationals Park and the countdown is on to the next game – only 15 days, 7 hours and 42 minutes!